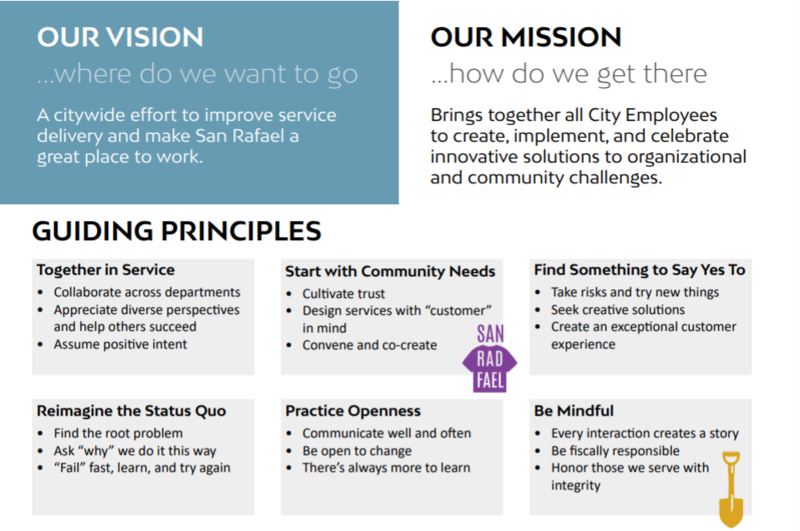 Below are several iterations of the guiding principles. Start with community needs. Embody the spirit of community service and work with the community to solve problems. Work Together. Do things together and work beyond silos. Appreciate each other, share responsibility and imagine the possibilities together. Say Yes! Be optimistic and look for ways to help people achieve success. Work Open. Be open to change. Share and make things open; it makes things better. Contagious Leadership. Make your time at work count. All your talents are essential to the bigger success of the team. Take Risks. Try new things, continuously learn and always work to improve the world around you. Honesty & Transparency. Be honest about what you can and can’t do. Communicate well and often. Question the Status Quo. Ask why we do something the way we do and seek ways to improve. Be Aware. Understand context and root problems. Resource stewardship. Be mindful and fiscally responsible with our resources.